It’s officially the first day of spring today and I feel it. There is a special longing for the first colorful winter flowers when it’s been gray for months. Admittedly, it was a short winter for me, but this is one of the things LA can’t deliver: The immense appreciation of bloom, scent and warmth in the air after a long, cold winter. I love it. The winter coats are moving to the attic. Hopefully they will stay there for the next 6 months. There are no measurements and you can’t go wrong. If you make too much, then use the cooked grains in a salad, a bread or heat for breakfast tomorrow. So choose your grain and cook according to the instructions with either water or milk or milk substitute. Drain the grain, which should be somewhat chewy and still have ‘bite’. Put in a serving bowl and drizzle first with 1-2 tablespoons of cream and then with your choice of sweetener, I prefer acacia honey for this particular dish. 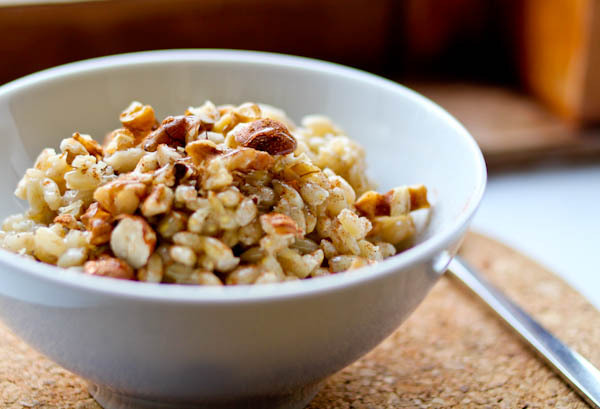 Coarsely chop a small handful of nuts like almonds and top with a sprinkle of ground cinnamon. Le Pain Quotidien breakfast porridge was cooked with chopped dates and topped with fresh blueberries. Bye bye sweet morning cravings, you will be very content until lunch. This entry was posted in Breakfast and tagged barley breakfast, barley porridge, barleyotto, filling breakfast recipe, spelt porridge. Bookmark the permalink.